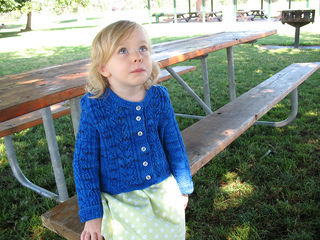 Annabelle is a girls’ cardigan featuring lace, Bavarian stitches and edges of seed stitch. 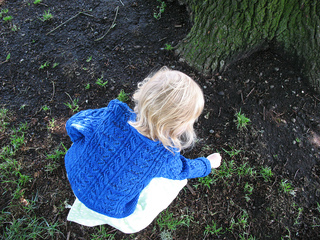 It is sized from children’s size 2-12 and worked with DK weight yarn in pieces and assembled. Update (9/14/2013): This pattern has been updated to include more length in the body, Stockinette stitch at the sides of the body and inner sleeves instead of seed stitch, and short-row sleeve caps worked from the top down. The pattern calls for working the sleeves flat, but they may also be worked in the round after joining the side body seams as well as the shoulder seams. Enjoy! Correction: In the 2013 version (and the old version) instructions on page 7 for left front should refer to Chart B, not Chart C.